Artistic photograph frames personalized just for you with cool thematic designs & great colors. Find unique engraved wooden picture frames, etched metal photo frame ornaments, pretty lockets, classic bookmarks & brag book wallets for gift-giving on birthdays, anniversaries, and graduations. Looking for the perfect picture frame for a special photograph of your family or beloved pet? Let us handcraft one that's just right! Shop 4x6 and 5x7 picture frames that feature Kyle's unique decorative metal designs in the corners. Choose from gold or silver designs of cats, dogs, sports, passtimes, letters and more. Get the number 80 for the picture of your grandma on her 80th birthday or the swimming design for the day your son won his swim meet. Then, select from 30 brilliant accent colors to go with your home's decor. Select hot pink or cobalt blue for a teen's room, add elegant copper or amber for a warm toned entry way or living room. Or, if your room has a pop of color throughout, match it with our bright turquoise, teal or spring green. Here is a close-up of the corner of the "Sun Rays" picture frame. The square area on this sample frame shows the dog and bone tree design - but Kyle has created over 500 designs in her studio for you to select from. The wood finish on this sample frame is maple, but you can customize it by selecting walnut, cherry, white, black, gold or stainless. 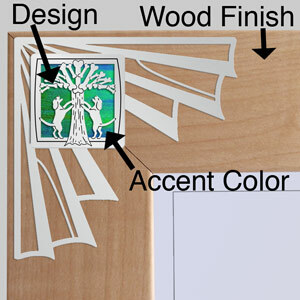 The accent color is the aluminum or iridescent film that is hand placed behind the design that you choose. There are 30 colors to choose from. In this sample, rainforest iridescent was selected - it is a gorgeous shimmery blue and green film that is one of Kyle's most popular colors.